When you think of the lunatic crazy deaths of young girls in New England history, particularly during the Halloween season, Salem is the first town that pops to mind. But the fear of young women in superstitious New England didn’t stop at witches. In the late 1800’s, disease ravaged New England in the form of tuberculosis mostly. It claimed entire families in mere months. With no knowledge then of “Consumption” being a virus, or of any kind of germ for that matter, frightened townspeople jumped to conclusions as to how death had spread so quickly. Vampirism. Rhode Island seemed to really take the vampire idea and run with it. Two young women come to mind: Mercy Brown and Nellie Vaughn. In Exeter, Rhode Island, the family of farmer George Brown saw a terrible thread of deaths due to Consumption. After three deaths, including young Mercy Brown, George’s son Edwin became very ill as well. Family and friends could only attribute the suspicious contagion to the work of vampires. And Edwin claimed that his sister, Mercy, had come to him at night, sitting on his chest to suffocate him. A distraught George exhumed the bodies of his family with the help of villagers to determine who was the vampire among them. While Mercy’s mother and sister had decomposed significantly, Mercy sent a panic through the community. She was virtually unchanged. Her cheeks were flushed. Her hair and nails had grown. She had moved in her grave. And blood was still in her heart and veins. Convinced that the blood was Edwin’s and that the vampire had been found, Mercy’s heart was removed and burnt. The remnants were mixed with water, and given to Edwin to drink, to “cure” him. He died two months later. While Mercy Brown is the better known vampire story, that of Nellie Vaughn is just as interesting. She was not a victim of a rash of tuberculosis, but an isolated incident of pneumonia. Her body was exhumed, but only to be moved. 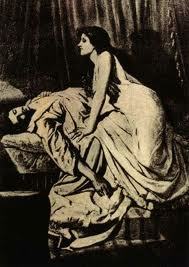 It is not until recently that Nellie is suspected of being a vampire. Author and vampire expert Michael Bell feels she is a case of mistaken identity, being the same age as Mercy, and having died at a similar date. But the mystery around the young lady still is evident. A resident of Nellie’s area, Marlene Chatfield, is almost an expert on Nellie these days, with the number of run-ins she has had with the deceased girl. It began with Marlene doing a grave rubbing on Nellie’s tombstone, when the paper became mysteriously destroyed and her charcoal disappeared. In August of 1993, Marlene returned with her husband to the grave. Her husband heard a woman’s voice say “I am perfectly pleasant,” while standing at the gravesite. Hardly pleasant, he than found himself covered in red scratches on his face that drove him from the cemetery. Still not to be deterred, Marlene returned again in September, where she struck up conversation with a young lady who claimed to be of a local historical society. When the subject of Nellie being suspected as a vampire came up, the girl became so agitated that Marlene left the cemetery. When she turned around, the girl was gone. Other stories associated with Nellie include visions of a woman hovering over her grave, pulling out her hair in despair. Several accounts of hearing “I am perfectly pleasant” are recorded, though no others include the assault Marlene’s husband underwent.